Wow, yesterday was a great day for caption writing, both on the blog and on our Facebook page! Our latest poster winner is Laurie Waud Sanders for her caption, "Your face is going to freeze that way." 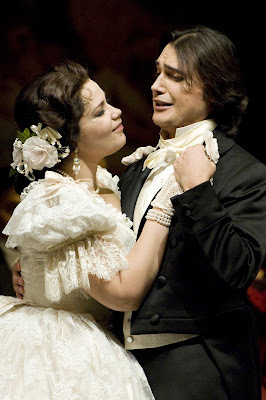 The countdown to the last few performances of La Traviata continues, and thus brings us another daily photograph. Tell us what's going on this picture - and make us laugh - and you could be our next Traviata poster winner! "No, I've never seen The Crow, why do you ask?"